I would like to thank each and every person who has ordered anything from us this week. I'm not used to people actually buying out releases. Steve Adamyk Band 7" release show sleeves are all gone! Luckily I still have lots with the regular sleeve. They sound identical, so don't worry about that one. Red Dons - Fake Meets Failure cassette is now out of print. Sam Coffey and the Iron Lungs - All To Myself 7" is extremely close to selling out. We're down to our last 10 copies or so so jump on that quick if you'd like a copy. 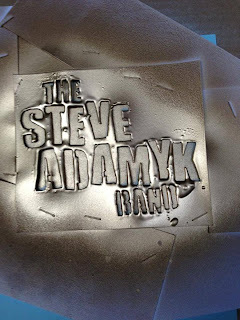 The release show for Steve Adamyk Band's new 7" Monterrey is tonight at Silver Dollar in Toronto. Come out and see a ton of awesome bands from the label. Buy a record. This is what they look like. Thank to Way Bad for knocking the artwork out of the park. Copies will be added to the webstore on Monday, July 22nd.